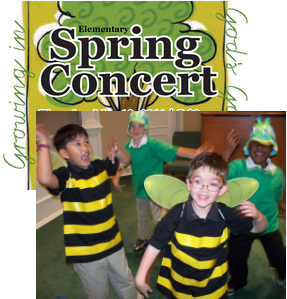 Bumblebees & Garden Bugs Practice for the Upcoming Performance of "Growing in God's Garden"
BBCS will present their elementary spring program showcasing student talent on Thursday evening, May 12, at 7:30. The elementary program entitled, "Growing in God's Garden", complete with costumes, props, music and drama, will be a delight to all who attend! The event will be held in the Bible Baptist Church auditorium, and is free and open to the public.